This easy recipe is as satisfying as it is healthful and allergen sensitive. The low-carb and low-fat approach makes it a good diet conscious lunch, and its ability to be hand food makes it a great party snack. Colorful and bright, with bold spice and warm and cool elements, make your next farmer’s market trip include items such as these! Prep time 10 minutes, cook time 25-30 minutes. Set the oven to 350 degrees. Open the tofu and let drain, wrap it in a dishtowel and compress to reduce moisture. 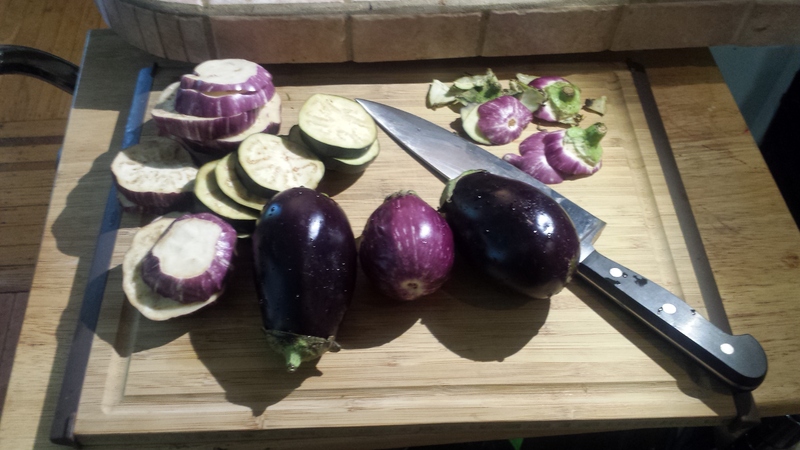 Slice the Eggplant, tomato, and drained tofu appx. 1/4 thick. 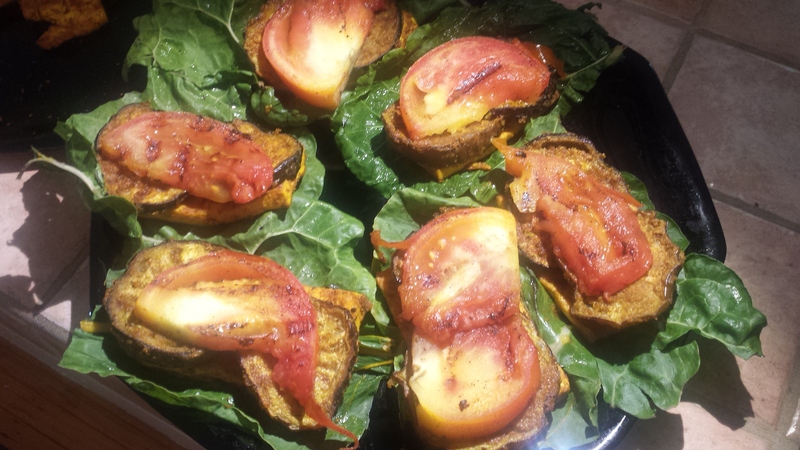 Mix together the spice marinade and paint both sides of the eggplant slices and tofu slices. 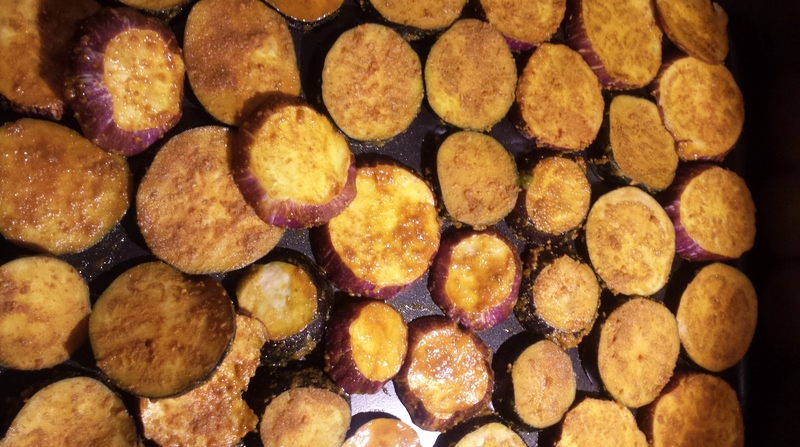 Place the eggplant slices evenly on a cookie sheet or roasting pan. Place into the center of the oven for about 25 minutes, flip over at the 15 minute mark. 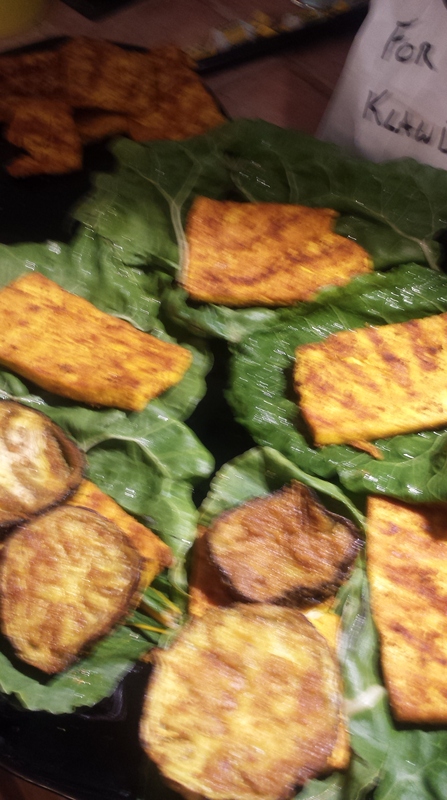 While the eggplant is roasting, “grill” the tofu on the stovetop on medium heat, on a grill plate, skillet or frying pan, or George Foreman grill equivalent. All but the frying pan will reduce both fat and moisture for a delightfully crispy and flavorful tofu cake. In the frying pan, a higher heat and or more oil may be needed for crispiness, but wonderful results with the spice mixture and pan searing are possible without adding additional fat also. 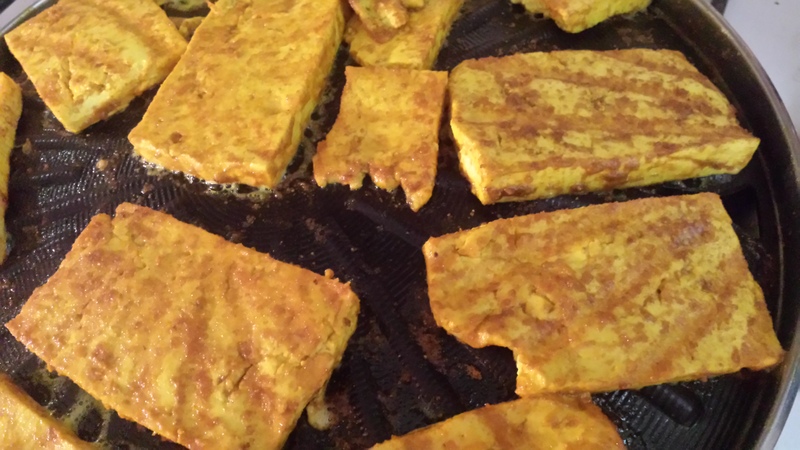 Cook tofu until desired texture, appx. 10-15 min, flipping over every 5. Take the tofu off the heat, and while still hot, add the tomatoes, not-marinated, for 5 minutes, flipping over, until soft. 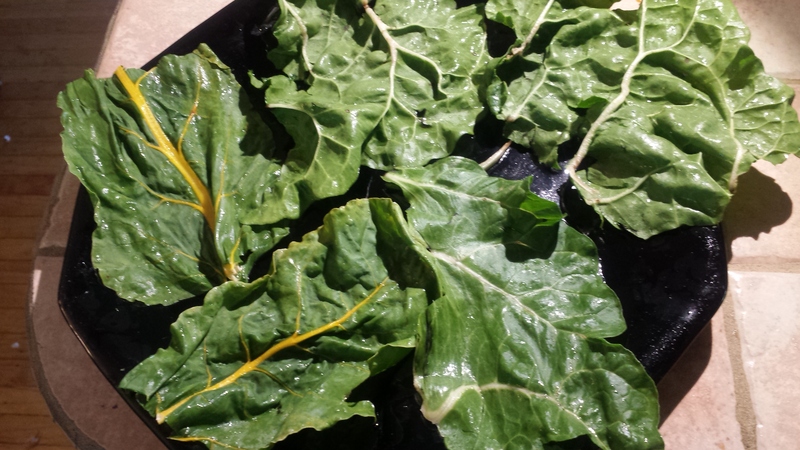 On a plate, lay out pieces of spinach or greens appx twice the size of the tofu slices. 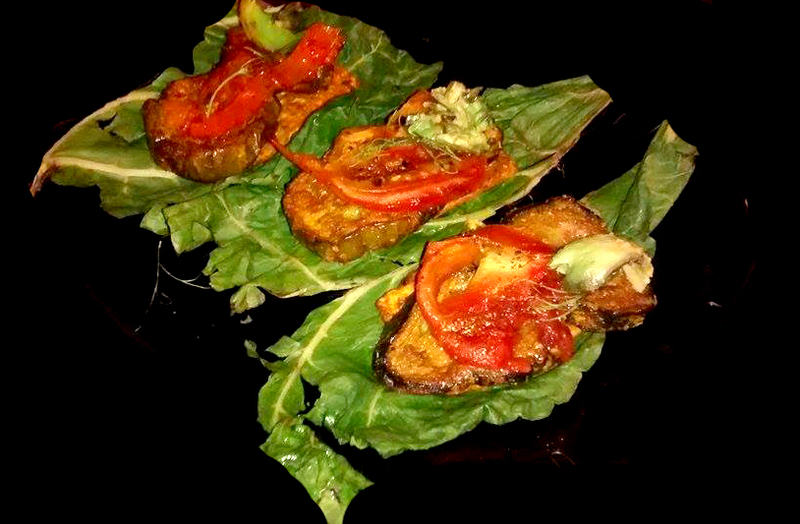 Place a grilled tofu slice, the eggplant, and then the tofu on top. 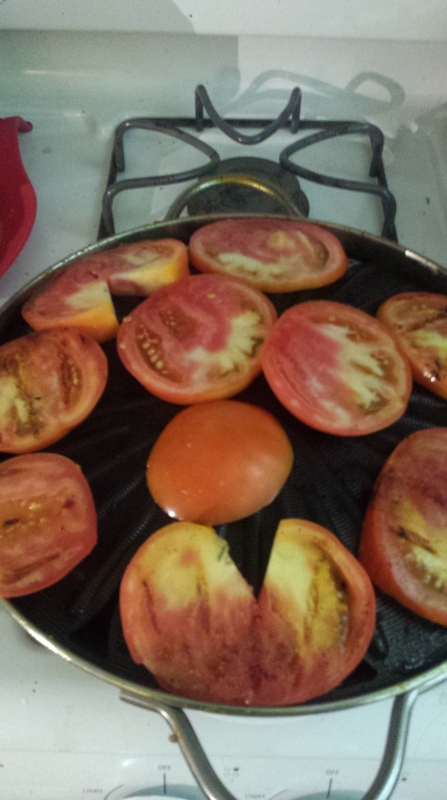 Add the tomato, with the slices cut in half. 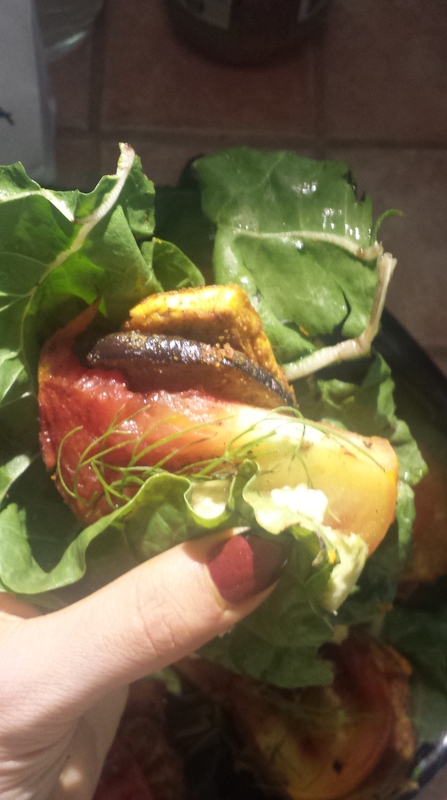 Sprinkle with fennel or dill, and some avocado shavings. Wrap up the greens and Enjoy! Fiber- Can We See the Forest for the Trees? Vegan Fashion- The List of Lists! How many see the Big Picture?